This course will teach you how to create a mixed media heart on a canvas at the same time as introducing basic mixed media skills with papers, paint and glue. All of the techniques demonstrated can be used for other projects as well. The course comprises of 12 video lectures with easy step-by-step instructions. We also include templates that will need to be printed out, if you decide to use them. At the end, we review the course and show you a few alternative mixed media heart canvases. You will watch just over an hour of video content. The project can be done in about 3-4 hours but we always suggest leaving your work at some stage, to come back to with a fresh way of looking at your project later. We would recommend this course to anyone who would like a quick and simple introduction to mixed media with fantastic results. At the end of this course, you will have a beautiful canvas, ready to hang on your wall, to give away as a gift or even sell to order. A detailed supply list is provided as a download. We also talk through what you need and why. The basic items are: a canvas, acrylic paints, brushes, PVA glue in a squeeze bottle, a printer to print out words (optional), scissors, coloured tissue paper and baby wipes (optional). 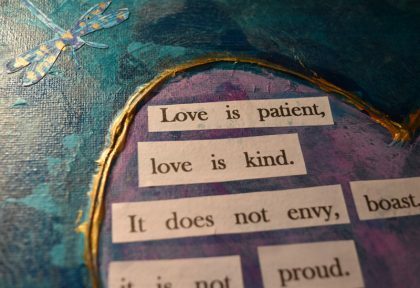 Learn how to create a mixed media heart. Use a variety of mixed media techniques like making 3D shapes with glue, layers of acrylic paint and paper, add pictures and cut outs. Gain confidence in playing with colours, papers and words. Know how to mix PVA and water to the correct consistency for working with delicate papers. Discover how to use every-day objects such as wet wipes for paint effects. Your end result will be a finished canvas ready to hang or give as a gift. This mixed media course is for beginners but also anyone who enjoys being creative and who would like to learn mixed media techniques. No prior painting or art knowledge is required. Especially for those who are longing to be creative but not sure where to start. The canvas can be personalised and the words provided are ideal as a wedding, anniversary or valentines gift. This course would be great for anyone looking for fresh ideas for home-crafted gifts.